Signals from the Isle of Wight (Rowridge) transmitter are particularly prone to interference from France during periods of high pressure and fine weather, as many aerials are not only pointing at the Isle of Wight, but also towards France "behind" the island. French signals are boosted when atmospheric conditions are right and potentially disrupt UK signals using the same frequencies. Additionally, some services from London's main transmitter use the same frequencies as Rowridge, as does the Stockland Hill transmitter serving East Devon. These can also cause localised interference when the conditions are right. 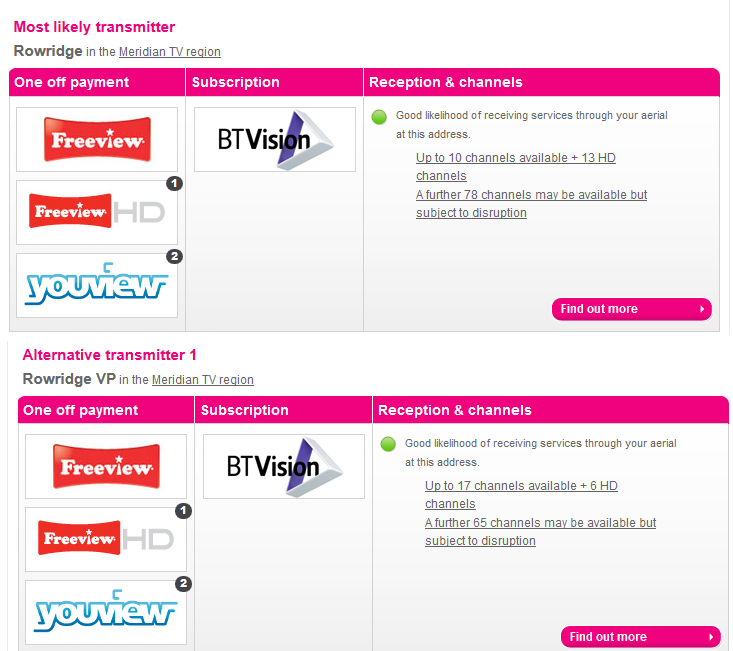 Rowridge broadcasts many Freeview services using both horizontal and vertical polarisation to help mitigate against interference from other transmitters. The "vertical polarisation" option means that viewers in parts of Hampshire, Dorset and West Sussex, living further away from the Isle of Wight/Portsmouth/Southampton area may be able to benefit by having their aerial turned, so that the elements go up/down, rather than across. Viewers closer to Rowridge on the Isle of Wight are better keeping their aerials as they are, as this is the optimal position for the forthcoming local TV channel and a some additional HD channels, which are broadcast at a lower power with limited range for viewers in and around the Solent area. Viewers can check if they can get a better signal from Rowridge/Isle of Wight by looking at www.digitaluk.co.uk/postcodechecker . 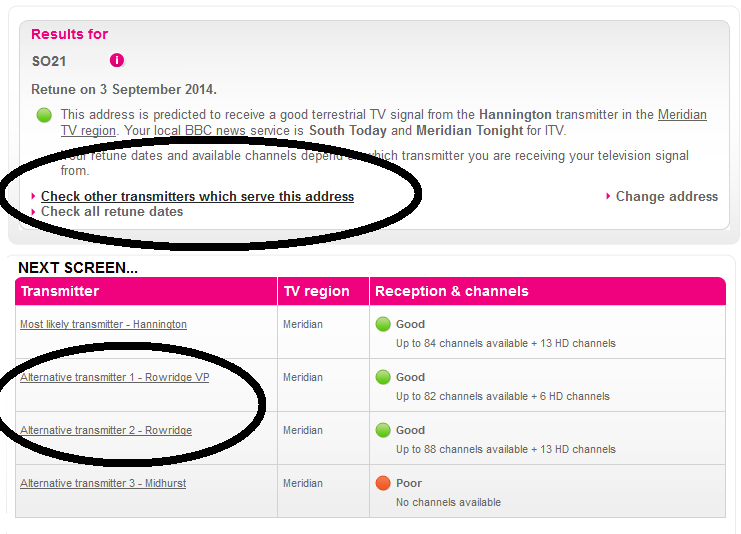 Click on "Check other transmitters which serve this address", circled below. On the next screen, it will list transmitter options. You can see both "Rowridge" and "Rowridge VP (Vertical Polarisation)" listed. In this example, "Rowridge" offers the most channels then any other transmitter available at that address, and that "Rowridge" and "Rowridge VP" both offer good reception. In some postcodes, this is different, with "Rowridge VP" offering the better overall coverage. Using a Chicester postcode, the postcode checker (below) shows that Rowridge VP offers a more reliable reception of channels. 78 channels are liable to disruption, often during fine weather from "Rowridge", but only 65 from "Rowridge VP". For non-HD viewers, it would be better to alter the aerial to receive the vertically polarised transmissions. HD viewers should note that not all Freeview HD channels are broadcast in both horizontal and vertical polarisation. Importantly, local aerial installers will be able to advise you on the options available in your area and may be able to suggest alternative measures if your Freeview reception from Rowridge is too unreliable. Digital UK, the organisation responsible for managing the digital terrestrial TV platform in the UK operates a Freeview Advice line, available on 08456 50 50 50. (Mon - Wed 9am - 8pm, Thurs-Fri 9am - 6pm, Sat 9am - 5pm Sun Closed) 0845 number charges vary from provider to provider, ranging from being inclusive calls on some packages to being significantly more expensive on mobiles. The information provided on this page is entirely independent of any broadcaster, Freeview or Digital UK and is intended as general advice and cannot replace the knowledge and insight of local aerial specialists, who should be able to advise on options specific to your location if your Freeview reception is unreliable for longer spells of time. Reception should normalise when the high pressure and sunshine comes to an end.